Attention to leadership and the characteristics of entrepreneurship has increased in recent years, due to technological advances and the advent of globalization and privatization that have had a significant impact on the business environment, competitive environment and local, international and global organizations, we have been growing interest in this subject, because of its role in economic growth at the macro level and the growth of organizations and expansion for the financial and material resources, which is the Entrepreneurship subject of important issues, especially with the accelerated rates of change in the business environment, which led to the increasing importance of this subject as one of the options used by the organization to adapt and adapt to competition and changes in demand. As interest emerged at the beginning of the nineties of the twentieth century modern concepts in strategic management field and was the most important concept of strategic capabilities, which is a helper for business organizations in the exercise of its business through planning to achieve superiority over competitors and accomplish goals and achieve competitive advantages. In the context of this and similar synonymous with the concept of strategic capabilities and concepts emerged these concepts it is with the ability or the core, which is the previous step to understand the organization strategic capabilities efficiency. As the strategic capabilities is responsible for the delivery of an important benefit for customers, and they need to be for a long time, and is characterized by permanent feature of the difficulty of being counterfeited, and consists of a range of sources, and contain an implicit power and complexity of a product of learning and experience. Therefore, this study aimed to review the Arab and foreign studies linking entrepreneurial characteristics in strengthening the strategic capabilities. Adegbite, S.A., Ilori, M.O., Irefin, I.A., Abereijo, I.O., and Aderemi, H.O.S. (2007). Evaluation of the Impact of Entrepreneurial Characteristics on the Performance of Small Scale Manifesting Industries in Nigeria. Journal of Asia Entrepreneurship and Sustainability, 111, 11-22. AlHrassi, J., Masa’deh, R., Al-Lozi, M., and Irtaimeh, H. (2016). The Impact of Management Innovation and Technological Innovation on Organizational Effectiveness: An Empirical Study from Managerial Staff Perspective in Sultan Qaboos University. Journal of Social Sciences (COES&RJ-JSS), 5(3), 309-339. Alpkan, L., Bulut, C., Guanday, G., Ulusoy, G., and Kilic, K. (2010). Organizaational Support for Intrapreneurship and its interaction with Human Capital to enhance innovative performance. Management Decision, 48(5), 17- 40. Alvarez, A., De-Lara, P., and Ruiz, M. (2012). How Entrepreneneurial Characteristic Influence Company Creation: A Coss-National Study of Countries Tested With Panel Data Methodology. Journal of Business Economics and Management, 12(3), 529-545. Antoncic, B. (2012). Risk Tacking in Entrepreneurship Translating the individual level . Risk Aversion into the Organization Risk Tacking. Journal of Enterprising Culture, 11(1), 45-61. Avanzini, D. B. (2009). Designing Composite Entrepreneurship Indicators: An Application Using Consensus PCA. World Institute for Development Economics Research. (UNU-WIDER). Basselier, A., Anna, M., and Raymond, L. (2001). Performance Outcomes of Strategic and IT Competencies Alignment. Journal of Information Technology, 19 (2), 158-190. Bolton, B., and Thompson, J. (2000). Entrepreneurs: Talent, Temperament, Technique. Butter Worth- Heinemann. Brazeal, G. (2000). The Genesis Entrepreneurship. International Journal of Human Resource Management, 4 (1), 13-45. Chen, L., Chen, C-C., and Lee, W-R. (2008). Strategic Capabilities, Innovation Intensity, and Performance of Service Firms. Journal of Service Sciences & Management, 13(6), 112-122. Chen, S., and Elston, J. (2013). Entrepreneurial Motives and Characteristics: An Analysis of Small Restaurant Owners. International Journal of Hospitality Management, 35(15), 294-305. Collings, D., Demirbag, M., Mellahi, K., and Tatoglu, E. (2010). Strategic Orientation, Human Resource Management Practices and Organizational Outcomes: Evidence from Turkey. International Journal of Human Resource Management, 21(14), 2589-2613.
Cooper, C., and Louis, W. (1998). Entrepreneurship: The Past, the Present, the Future. A Paper Presented at USASBE. Croteau, A.M., and Raymond, L. (2004). Performance Outcomes of Strategic and IT Competencies Alignment. Journal of Information Technology, 19(3), 178-190. Culhane, J-M. (2009). The Entrepreneurial Orientation Performance Linkage in High Technology Firms – An International Comparative Study (Germany . United States). Unpublished Master Dissertation, University of Massachusetts, Massachusetts, USA. Daft, R. (2014). New Era of Management, 9th Edition, South-Western, Cengage Learning, Australia. De Jong, J.P.J., Parker, S.K., Wennekers, S., and Wu, C. (2011). Corporate Entrepreneurship at the Individual Level: Measurement and Determinates. Journal of Scientific Analysis of Entrepreneurship and SMEs, 13(4), 1-27. Floyd, S., and Wooldridge, B. (2010). Knowledge Creation and Social Networks in Corporate Entrepreneurship: The Renewal of Organization Capability. Business Journal, 29(14), 15-45. Gelderen, M.W., and Thurik, A.R. (2005). Success and Risk Factors in the Pre Startup Phase. Small Business Economics,24(4), 360-380. Gökmen, A., and Buğra, A. (2011). The Effect of Knowledge Management Technological Capability and Innovation on the Enterprise Performance: A Comprehensive Empirical Study of the Turkish Textile Sector, 10(4), 1-10. Henning, M., Neergaard, H., Fisker, S., and Ulhøi, J. (2009). Entrepreneurship in the Knowledge Intensive Sector Influential Factors at Start-up and Early Growth Phase. Proceeding of the 13th Conference Nordic Small Business from the Period 10/06/2004 - 13/06/2004, AARHUS University. Hisrich, R., Peters, M., and Shepherd, D. (2005). Entrepreneurship: The Social Science View. Oxford University Press, London. Huang, H.C. (2011). Technological Innovation Capability Creation Potential of Open Innovation: A Cross-Level Analysis in the Biotechnology Industry. Technology Analysis and Strategic Management, 23(1), 49-63. Huffman, T. (2003). When is Entrepreneurship Good: The Effect of Information Asymmetry and Produce/Consumer Interface on Innovation. Unpublished Doctoral Thesis, University of Kentucky, Istanbul. Turkey. Ireland, R.D., and Covin, J.G. (2009). Conceptualizing Corporate Entrepreneurship Strategy. Entrepreneurship Theory and Practice, 33(1),19-46. Irigoyen, C. (2007). Where Do Entrepreneurs Come from. Unpublished Master Dissertation, University of Chicago, Chicago, USA. Jaafar, M., Maideen, A., and & Sukarno, Z. (2010). Entrepreneurial Characteristics of Small and Medium Hotel Owner-Managers. World Applied Sciences Journal, 17 (10), 54- 62. Jay, W. (2008). The Role Marketing Capabilities in Competitive Advantage and Innovation Strategy. Journal of Strategic Marketing, 11(1), 15-35. Jennings, D., and Hindle, K. (2004). Corporate Entrepreneurship and Equifinality an Empirical Analysis of Strategy-Structure-Performance. Journal of academy of Management, 64(18), 13-45. Karimi, S., Biemans, H., Lans, T., Arasti, Z., Chizari, M., and Mulder, M. (2011). Application of Structural Equation Modelling to Assess the effect of Entrepreneurial Characteristics on Students’ Entrepreneurial Intentions, 15(3), 18-34. Kusar, M. (2010). The Development and Renewal of Strategic Capabilities. Unpublished Master Dissertation, Georgia State University, Georgia, USA. Lee, J-S., and & Hsieh, C-J. (2010). A Research in Relating Etntrepreneurship, Marketing Capabilitiy, Innovative Capability and Sustained Competitive Advantage. Journal of Business & Economics Research, 9(8), 109-120. Lenz, C. (1980). Strategic Capability: A Concept and Framework for Analysis. Academy of Management Review, 5(2), 23-57. Maguire, S. (2008). Entrepreneurial Organization Culture: Construct Definitions and instrument Development and Validation. Unpublished Doctoral Thesis, George Washington University, Washington, USA. McDaniel, B.A. (2000). Survey on Entrepreneurship and Innovation. Journal of Social Science, 37(2), 277-284. Merlo, O., and Auh ,S. (2009). The Effects of Entrepreneurial Orientation, Market Orientation, and Marketing Subunit Influence on Firm Performance, Judge Business School, University Of Cambridge , USA. Michalski, T. (2004). Radical Innovation Through Corporate Entrepreneurship From A Competence-Based Strategic Management Perspective, Unpublished Master Dissertation, University of Applied Sciences Frankfurt, Germany. Ming-Huei, C., Taichung, T., and Cangahuala, G. (2010). Corporate Entrepreneurship Environments and Organizational Performance in Technology Manufacturing Sector. Technology Management for Global Economic Growth Journal (PICMET), 12(6), 1-9. Mokaya, S., and Namusonge, M., and Sikalieh, D. (2012). The Concept of Entrepreneurship in Pursuit of a Universally Acceptable Definition. International Journal of Arts and Commerce . 6(1), 15-40. Muinaa, F., and López, J. (2007). Explaining and Measuring Success in New Business: The Effect of Technological Capabilities on Firm Results. Journal of Science Direct, 27(2), 30-46. Nasution , H., and Mavondo, F.T. (2008). Organizational Capabilities . European Journal of Marketing, 42(3/4),477-501. Ortega, M. J. (2010). Competitive Strategies and Firm Performance: Technological Capabilities’ Moderating Roles. Journal of Business Research, 63(15), 1273-1281. Parnell, J. (2011). Strategic Capabilities, Competitive Strategy, and Performance among Retailers in Argentina, Peru and the United States. Management Decision, 49(1), 139-155. Porter, M. (1998). Competitive Strategy: Techniques for Analyzing Industries and Competitors. New Introduction Copyright, The Free Press, New York. Richardson, J. (2004). Entrepreneurship and Development in Asia, www.sbaer.uca.edu/research/usabe/2004/pdf/42pdf . Rodriguez, C., Wise, J., Ruy M. (2013). Strategic Capabilities in Exporting: An Examination of the Performance of Mexican Firms. Management Decision, 51(8), 1643-1663. Shane, S., Locke, E., and Collins, C. (2003). Entrepreneurial Motivation. Human Resource Management Review, 13(5), 257- 279. Söderlund, J. (2005). Developing Project Competence: Empirical Regularities in Competitive Project Operations. International Journal of Innovation Management, 19(4), 451-480. Stevenson, H., and Jarillo, J. (1990). A Paradigm of Entrepreneurship: Entrepreneurial Management. Strategic Management Journal, 11(3), 17-27. Tajeddini, K., and Mueller, S. (2009). Entrepreurial Characteristics in Switzerland and the UK: A Comparative Study of Techno–Entrepreneurs. Journal of International Entrepreneurship, 7(1), 1-25. Tan, J. (2010). Characteristics of Regulatory Environment and Impact on Entrepreneurial Strategic Orientation: An Empirical Study of Chinese Private Entrepreneurs. Academy of Management Journal, 29(12), 106-110. Teece, D., Pisano, G., and Shuen, A. (2010). The Dynamic of Strategic Capabilities. Strategic Management Journal, 18(7), 509-533. Tomas M., Charles, C., and Destan, K. (2003). The Role of Entrepreneurship in Building Cultural Competitiveness in Different Organizational Types. Journal of Management , 29(3), 401-426. Weaver, M., Kreiser, P., and Marino, L. ( 2002). Assessing in Environment-EO Link: The Impact of Environmental Hostility on the Dimensions of Entrepreneurial Orientation. Journal of academy of Management, 35(7), 122-147. Wong, W., Cheung, H., and Venuvinod, P. (2005). Individual Entrepreneurial Characteristics and Entrepreneurial Success Potential. International Journal of Innovation and Technology Management, 20(3), 12- 48. Zain, Z., Akram, A., and Ghani, E. (2010). 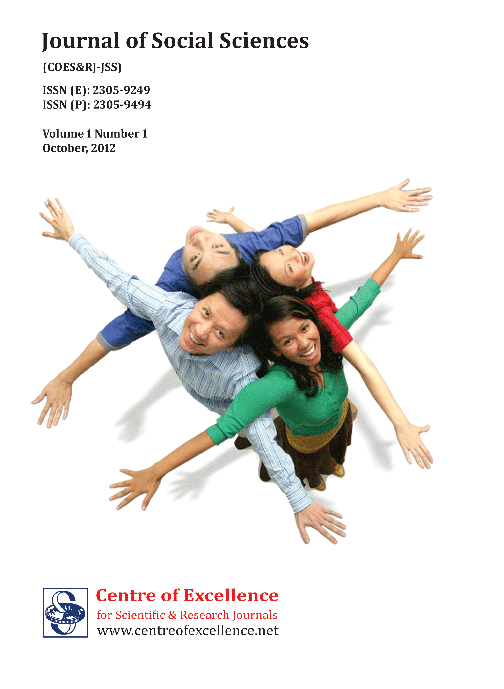 Entrepreneneurship Intention among Malaysia Business : Students, Canadian Social Science Journal, 6(3), 34- 44. Zhang, G., Peng, X., and Li, J. (2008). Technological Entrepreneurship and Policy Environment: A Case of China. Journal of Small Business and Enterprise Development, 15(4), 733-751. AL-LOZI, Kholoud Sudqi Abdullah; ALROWWAD, Ala'aldin. The Role of Entrepreneur Characteristics on Enforcing Strategic Capabilities: A Literature Review. Journal of Social Sciences (COES&RJ-JSS), [S.l. ], v. 6, p. 29-52, jan. 2017. ISSN 2305-9249. Available at: <http://centreofexcellence.net/index.php/JSS/article/view/jss.2017.6.1.29.52>. Date accessed: 24 apr. 2019. doi: https://doi.org/10.25255/jss.2017.6.1.29.52.